Why Buy This Crochet Hooks Set from Looen ?? We innovate our products based on our customer¡¯s experience. We listen to each suggestion and feedback and try to meet our customer¡¯s needs. Our success is not measured by our sales but by how many extremely satisfied fans and customers that have enjoyed using our products. Always worry-free transaction when you buy from us. Check us out by clicking the blue ¡°LOOEN Craft¡. Great value set with a portable bag you will have.Save your space. mark a stitch. measure a length- this set has everything you need. 1 x Storage Case.Case Size(L*W*H):18.5 x 15 x 4.5 (cm). 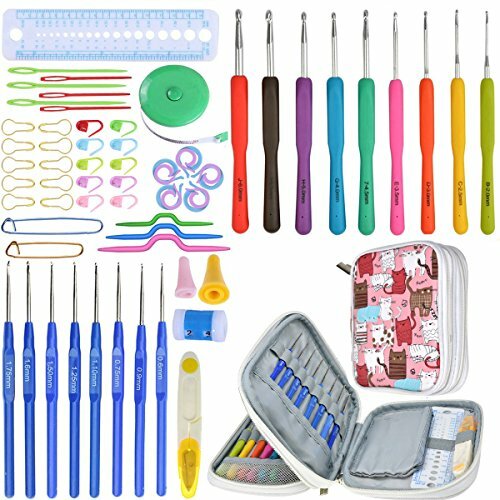 COMPREHENSIVE CROCHET HOOKS SETS KIT.Each kit contains 8 blue plastic handle hooks & 9 colorful silicone handles hooks and 47pcs accessories. it met your any need.Best choice for beginners and professionals crocheter. CONVENIENT&COMFORTABLE.The crochet needle is smooth,work fine.if you just crochet plain works,the plastic handle is ok for you.if you will crochet for long time,you can choose the silicone handle hook.it is very comfortable.good for arthritis. LUXURY CROCHET HOOK STORAGE BAG.Multi-function storage bag can hold all hooks avoiding missing.There is small bag in storage that can contain some sharp accessories advoiding hurt your finger.Great for traveling crocheters. IDEA of GIFT.Great crochet hooks ergonomic kits for beginners knitter or crocheter, Great gift idea for Christmas, Mother's Day, Birthday or any other situations. If you have any questions about this product by LOOEN, contact us by completing and submitting the form below. If you are looking for a specif part number, please include it with your message.